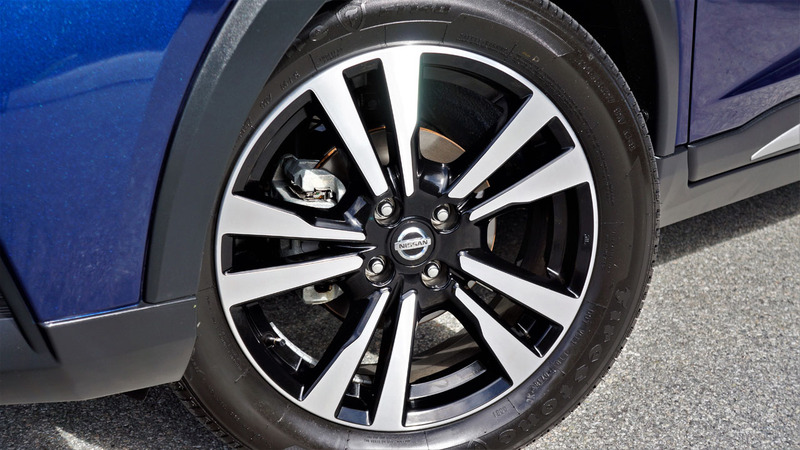 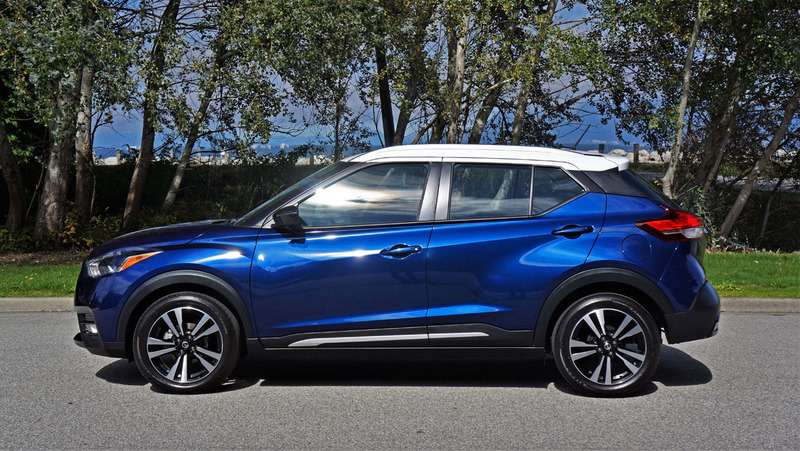 If you want an SUV, but only have money for a compact car the new Nissan Kicks makes a lot of sense. 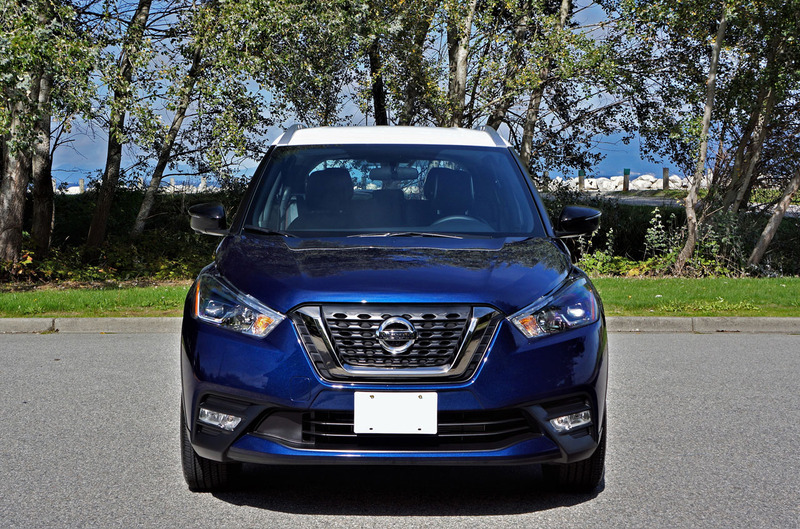 The Kicks is the most affordable crossover SUV available in Canada, starting at only $17,998 before freight and fees. 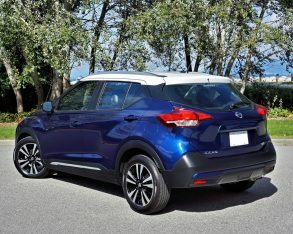 My tester was in top-line SR trim, which meant that it stickers at $22,798 (I priced it out in CarCostCanada, which also provides dealer invoice pricing and rebate info that’s designed to save its members thousands when purchasing a new car, so check it out), but that’s still not a whole lot for a very well equipped crossover, not to mention one that looks as fashionable as it does. 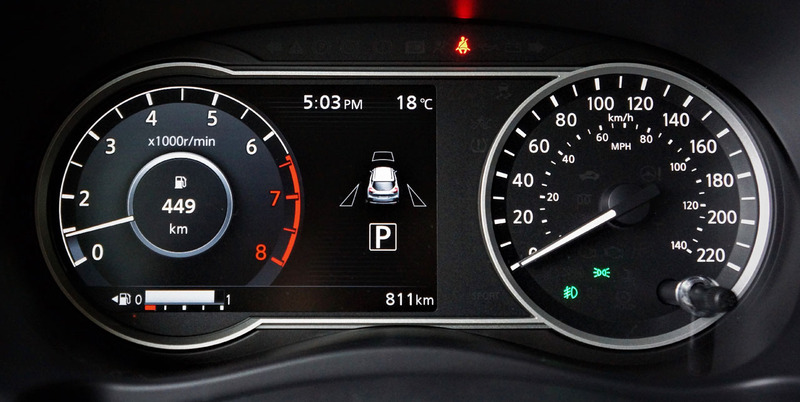 Anyone who’s been paying attention to this market segment will know it’s a very full field, now comprising 16 rivals. 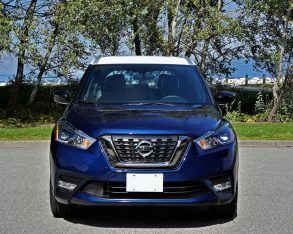 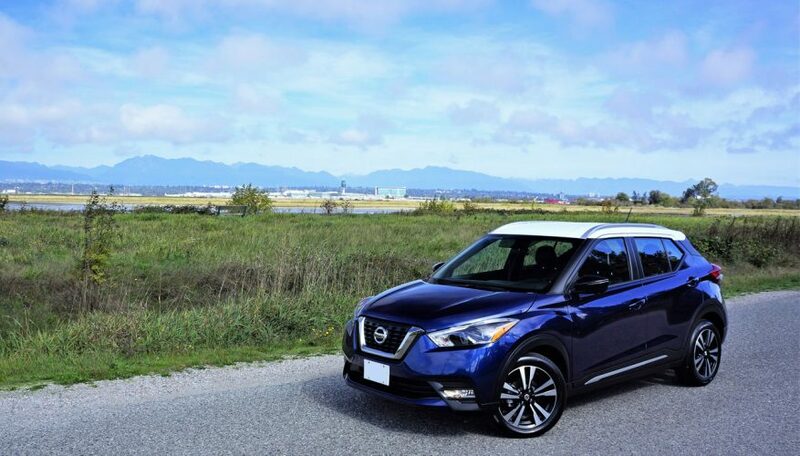 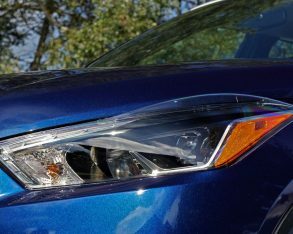 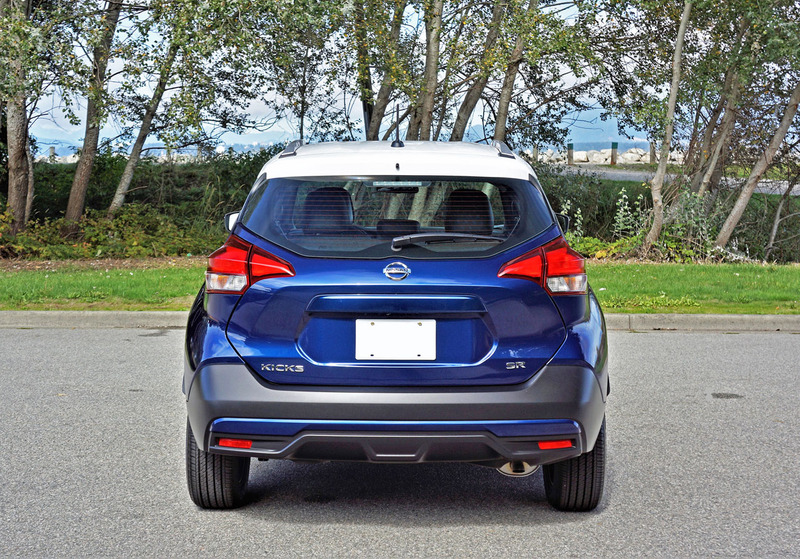 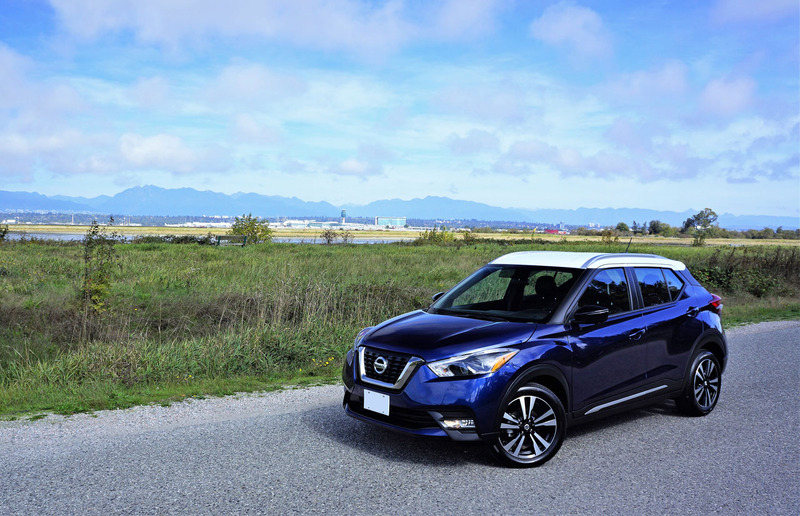 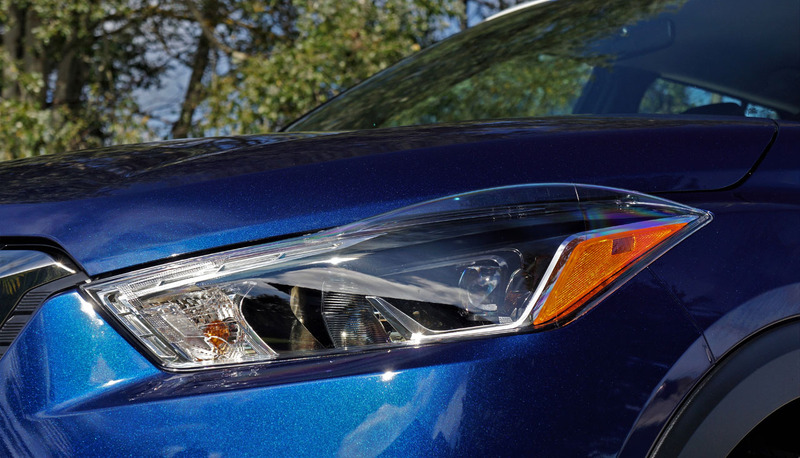 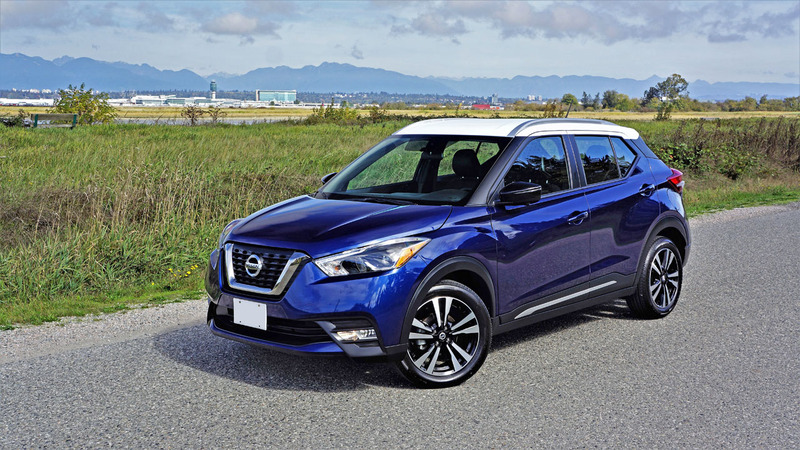 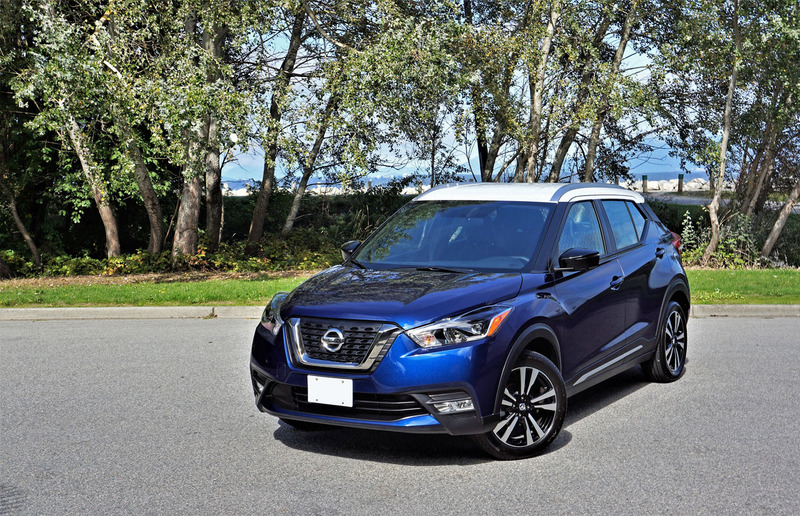 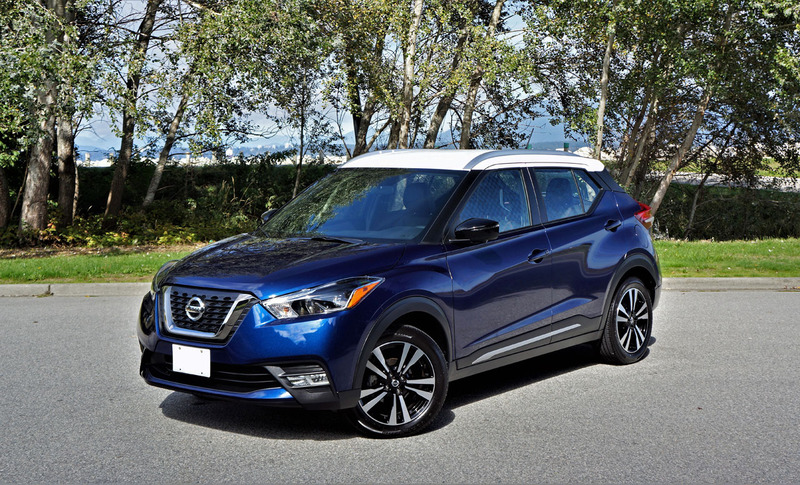 Amazingly Nissan has two in this category alone, the Kicks slotting in just below the Qashqai, a slightly larger model that, since arriving about a year and a half ago, has already taken Canada’s subcompact SUV segment by storm. 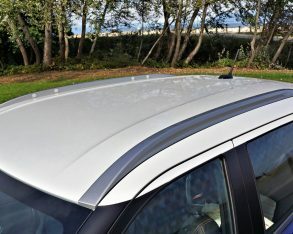 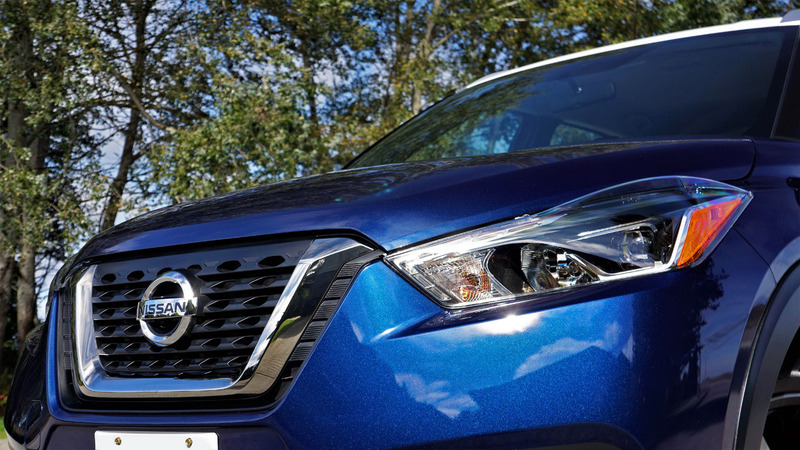 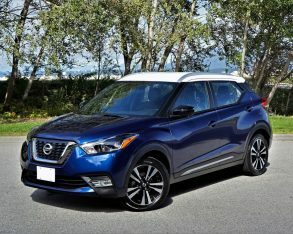 Above that is the ever-popular compact Rogue, plus the larger mid-size five-seat Murano and seven-passenger Pathfinder, plus finally the Armada that literally tops off the range. 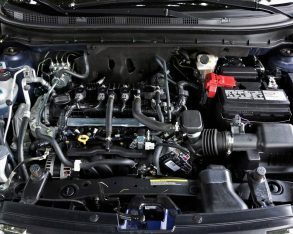 Topping off the Kicks, my SR trimmed tester was nicely equipped with some impressive features like a really sporty looking set of 17-inch machine-finished alloys with black painted pockets that came wrapped with 205/55 all-season tires, a sophisticated looking and very bright set of auto on/off LED low beam headlights with LED signature accents, powered and heated side mirrors with integrated LED turn signals, silver roof rails, plus plenty on the outside. 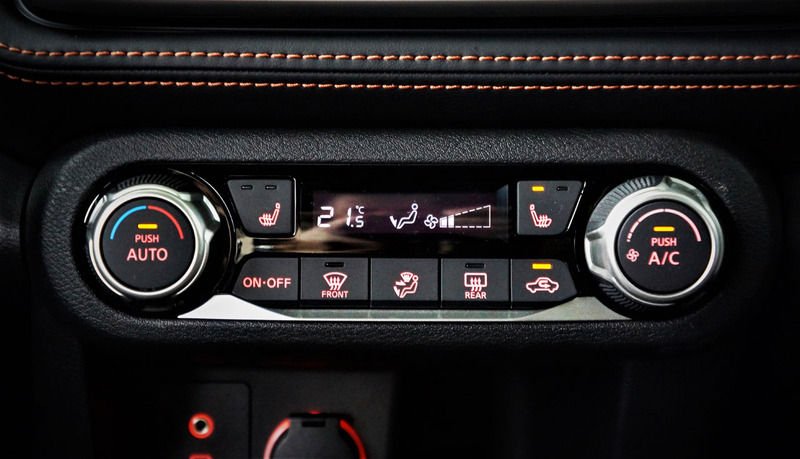 You can warm up the Kicks before venturing into the cold with a remote starter, and I always appreciate the ease of getting inside with proximity-sensing keyless access. 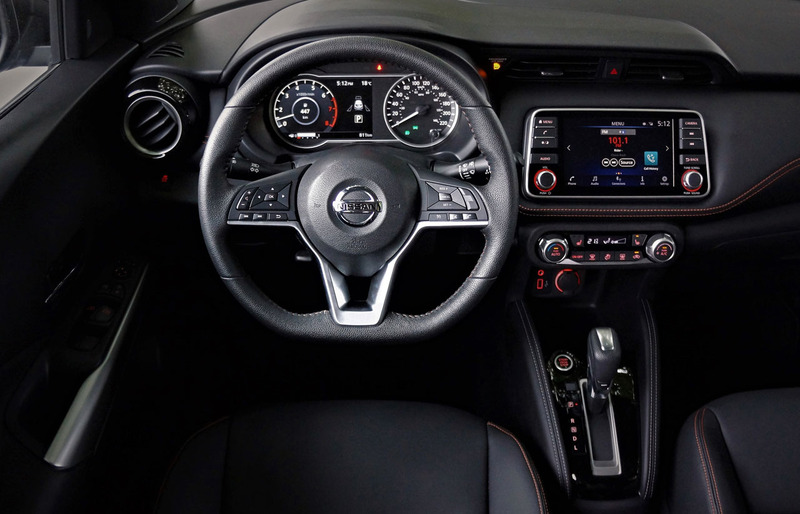 Once seated, the large 7.0-inch Advanced Drive-Assist Display that digitizes the left two-thirds of the primary gauge cluster, including the tachometer, is an impressive bit of advanced kit that immediately makes itself known. 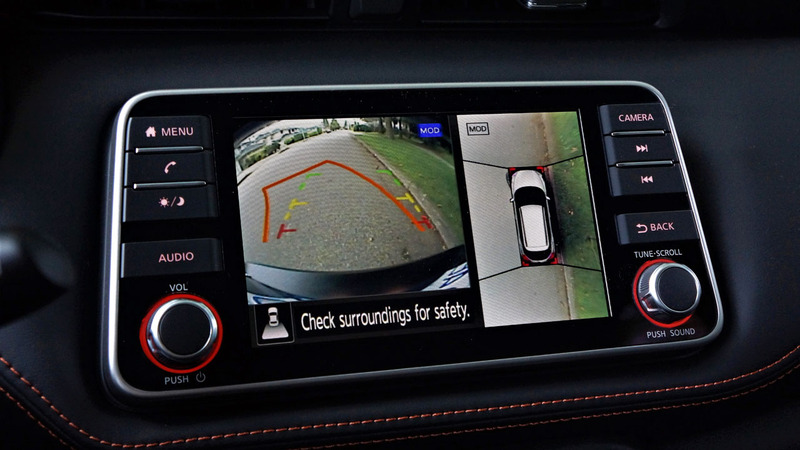 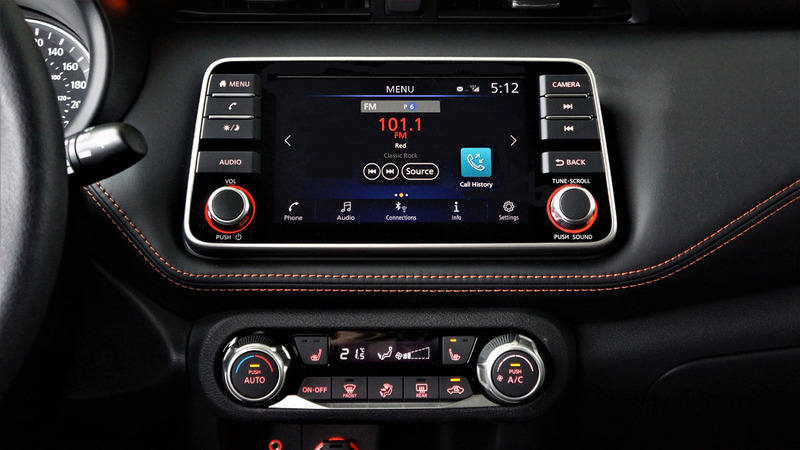 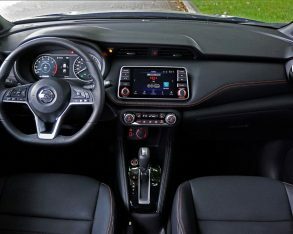 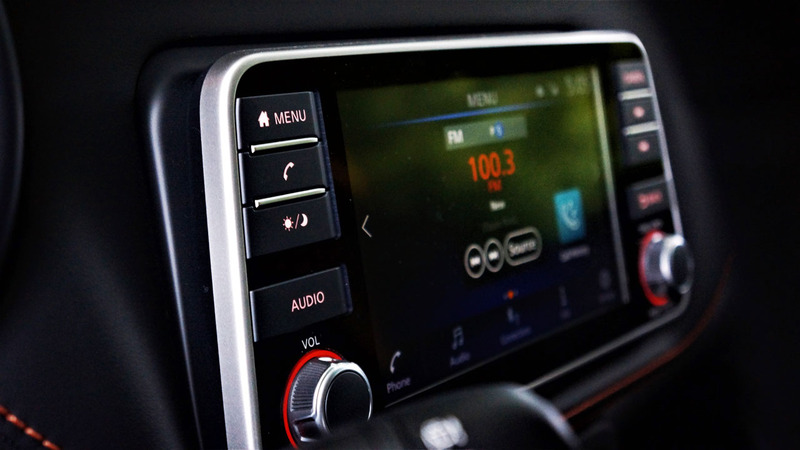 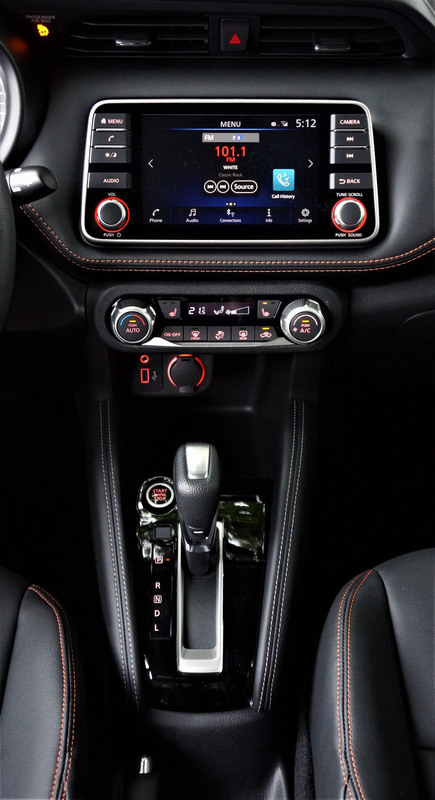 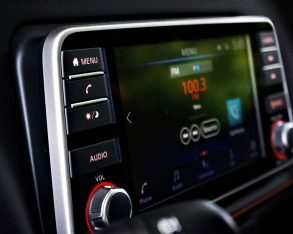 It’s controlled by high-quality illuminated steering wheel switchgear, and provides a large area for a fairly comprehensive assortment of additional functions, while Nissan also includes Apple CarPlay and Android Auto to the standard tablet-style 7.0-inch fixed infotainment touchscreen with this model. 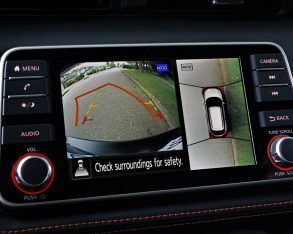 The display, which is really impressive for the class thanks to its high resolution, deep, rich colours, and, well, decent enough graphics, also includes a clear and useful Intelligent Around View Monitor (I-AVM) that splits the screen with a dynamic guidelines enhanced backup camera to the left and 360-degree overhead bird’s-eye view to the right, plus the infotainment touchscreen also controls a Bose Personal Plus audio system with six speakers including two UltraNearField speakers within the driver’s headrest. 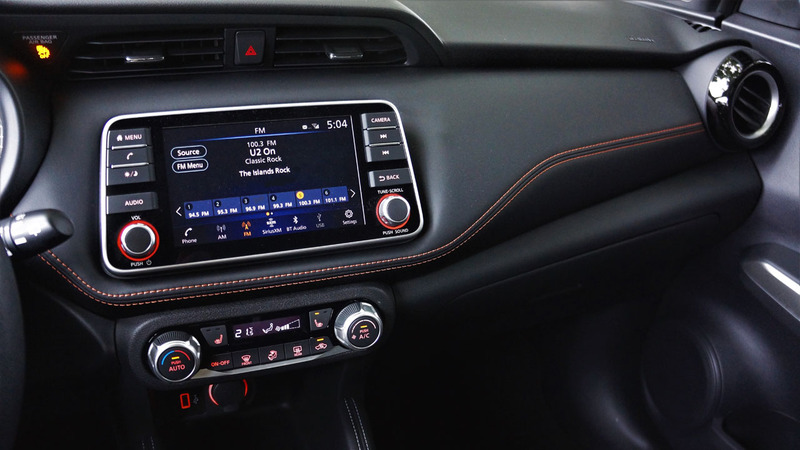 It delivered excellent audio quality for the class, with really deep, resonant bass tones as well as wonderfully bright highs, while satellite radio is always big on my favourites list. 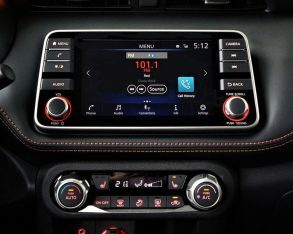 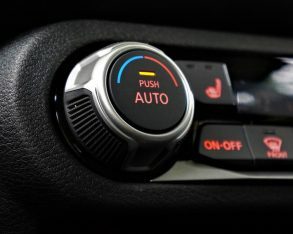 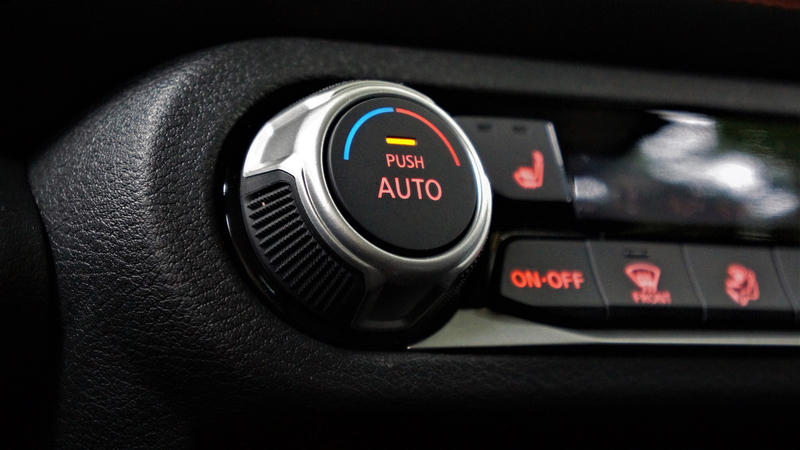 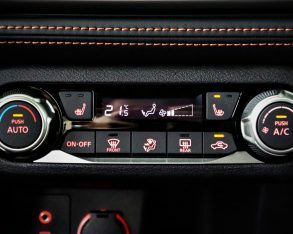 Just below, the single-zone automatic climate control system gets its own nicely sorted interface, this also housing two-way heatable front seat controls that warmed up quickly and stayed hot when needed, while just underneath the HVAC interface you’ll find a small media interface floating above a large, handy tray for your stowing a smartphone. 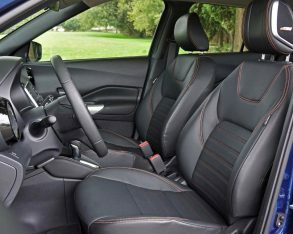 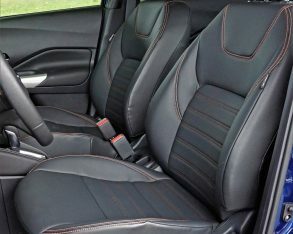 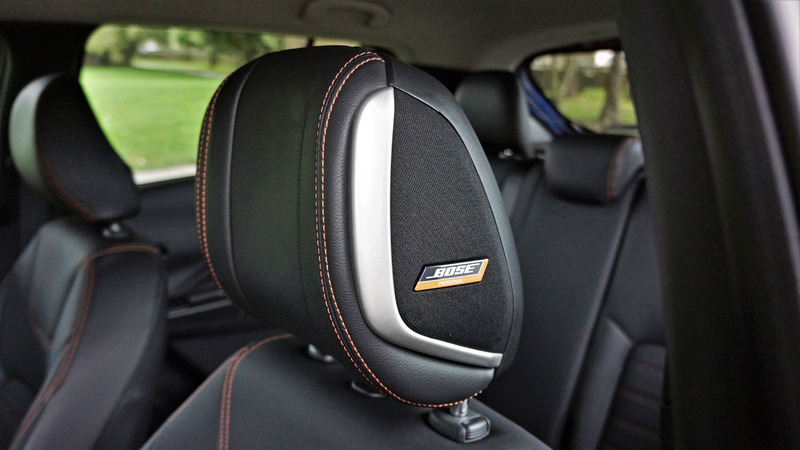 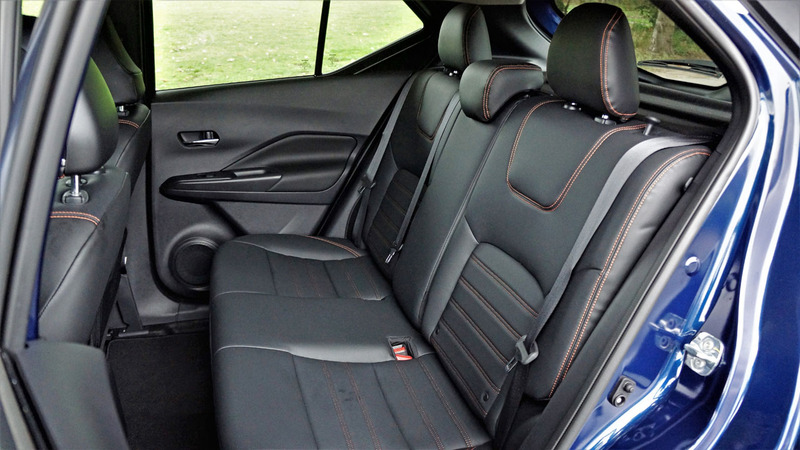 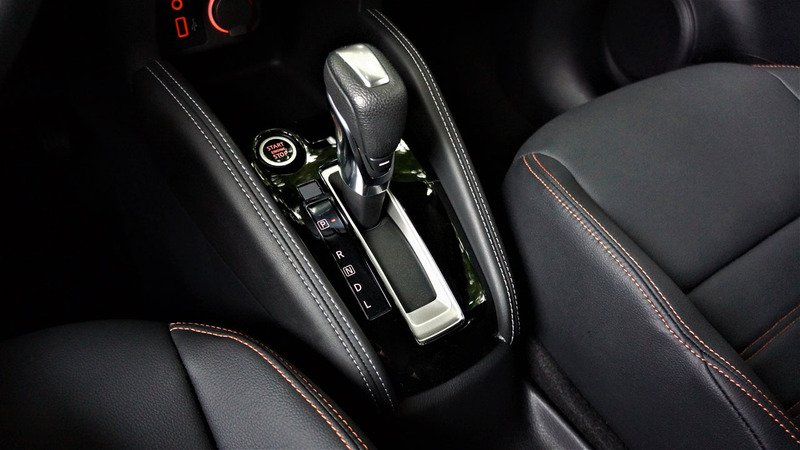 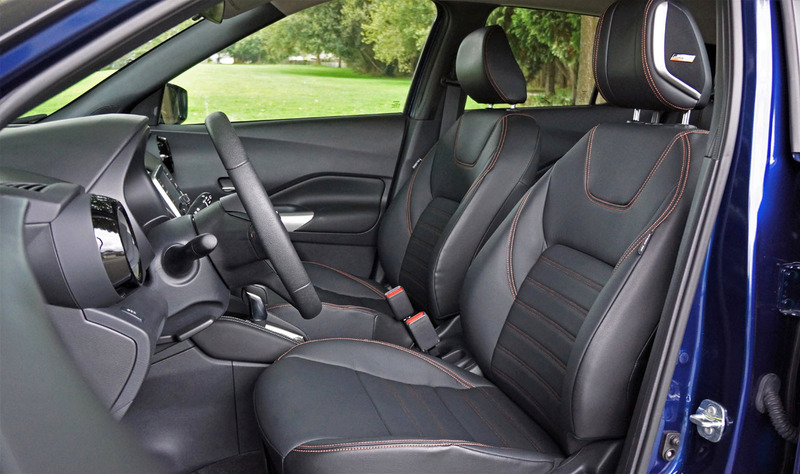 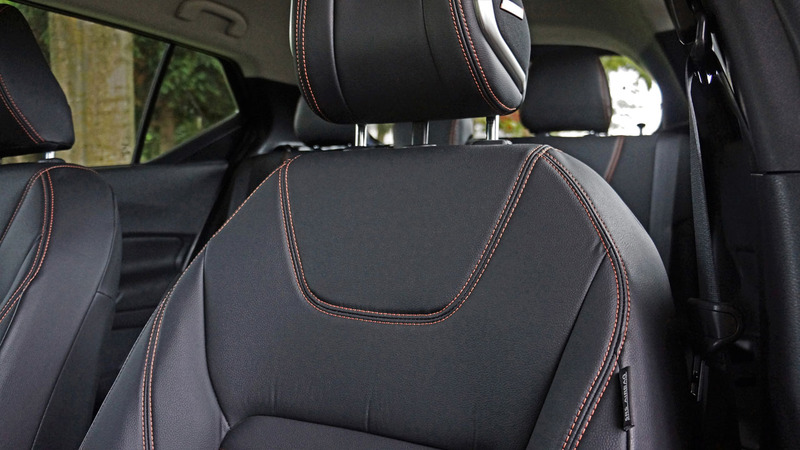 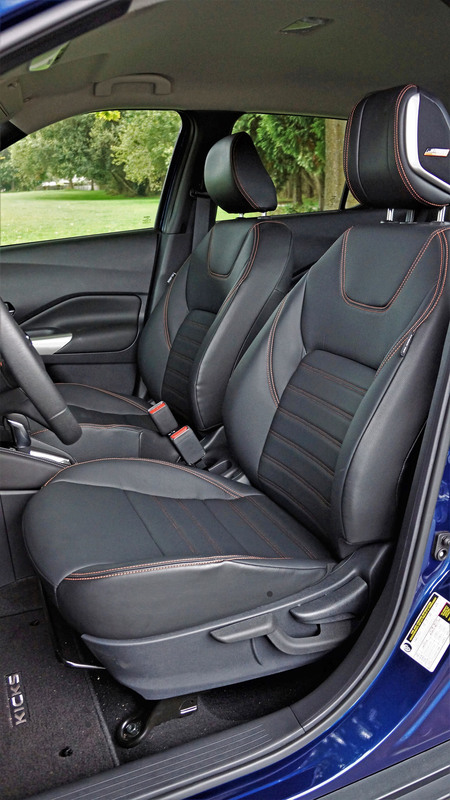 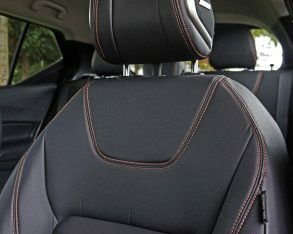 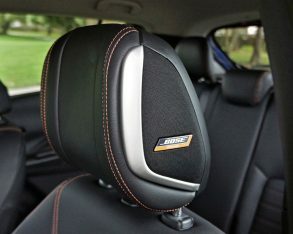 The leather-like Prima-Tex upholstery, which covers the instrument panel ahead of the front passenger (yes, that’s some pretty serious premium-level attention to detail for this class) as well as the seats, looks and feels authentic, while its orange contrast stitching is a tastefully stylish touch. 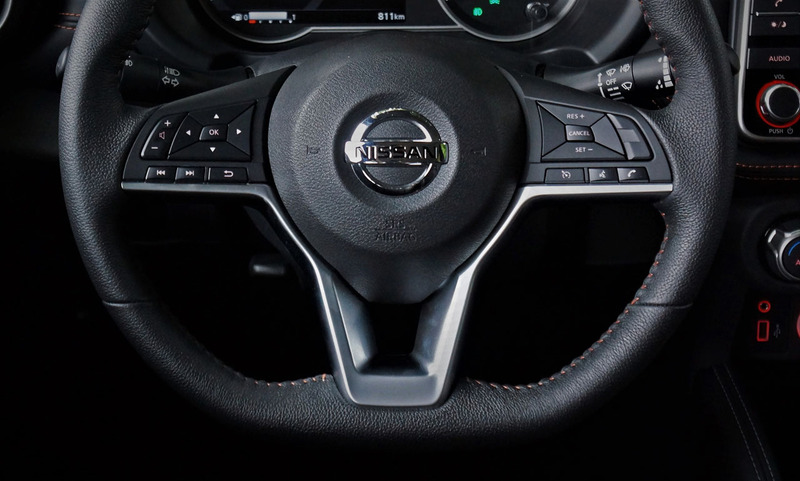 Nissan matches this with a real leather wrap for the steering wheel rim, also highlighted by orange stitching, plus leather adorns the gearshift knob as well, not to mention padded leatherette down each side of the centre console, although for some reason this is trimmed with white contrast stitching. 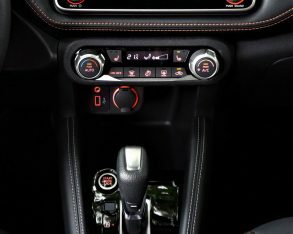 There’s some nice glossy piano black surfacing around the shifter and plenty of satin-silver metallic detailing everywhere else, while Blind Spot Warning with Rear Cross Traffic Alert is included with the SR as well, plus more. 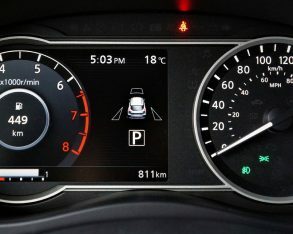 Some of the features noted above get pulled up to this SR from the aforementioned mid-range SV trim line, while the base S model actually includes an impressive list of items not yet mentioned, such as fog lamps, pushbutton ignition, Fine Vision electroluminescent primary gauges, tilt and telescopic steering, variable intermittent wipers, the 7.0-inch centre touchscreen already noted, multiple USB charging and connectivity ports, ultra-comfortable Zero-Gravity seats, all the usual active and passive safety features including standard Intelligent Emergency Braking, tire pressure monitoring, a driver’s knee airbag, and more. 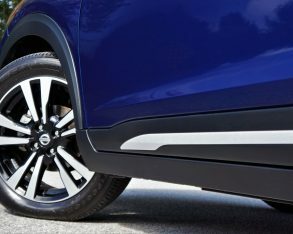 As noted the Kicks is an entirely new model, whereas the vehicle it replaces should be well known to most who follow the auto industry. 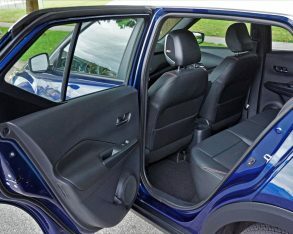 The oddball Juke was either loved or loathed thanks to extremely quirky styling, as was the wonderfully unusual Cube that left our market sooner than I’d hoped it would, but the new Kicks won’t suffer from unorthodoxy. 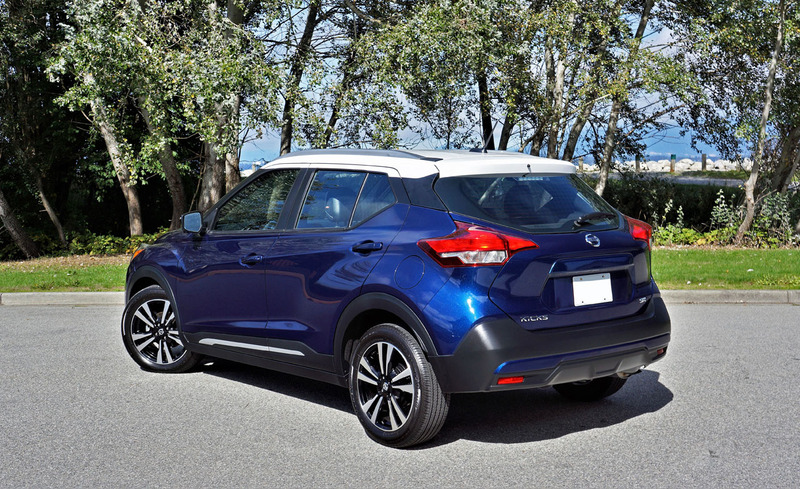 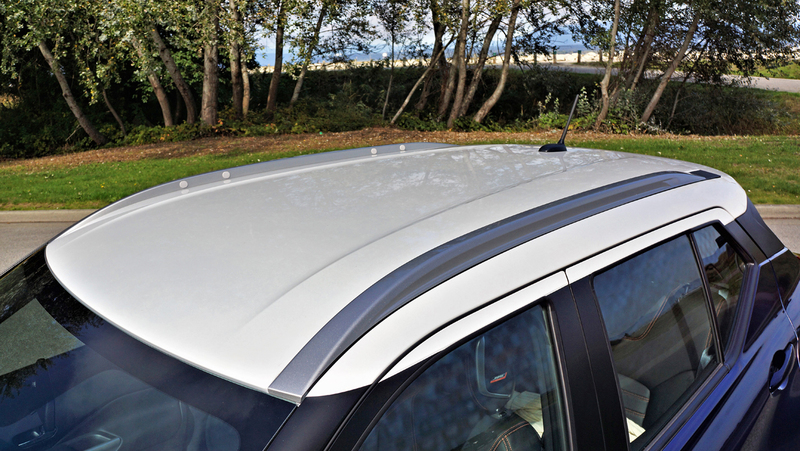 It’s cute and fun loving, yet wears sheet metal that should be more palatable to the masses. 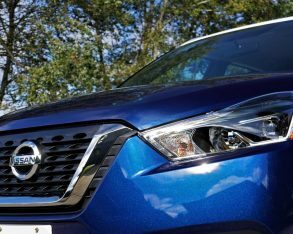 What’s more, that aforementioned starting price means it’s a lot more approachable to those masses than the Juke ever was, boding well for a very promising future. 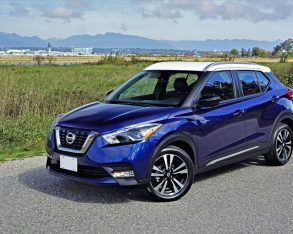 Those who fell for the Juke due to its surprising high-speed agility and capable turbo-four/AWD drivetrain will be less enamoured with the Kicks, at least on paper. 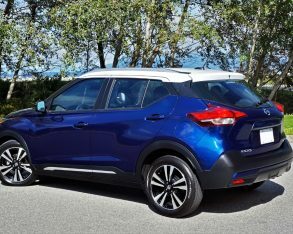 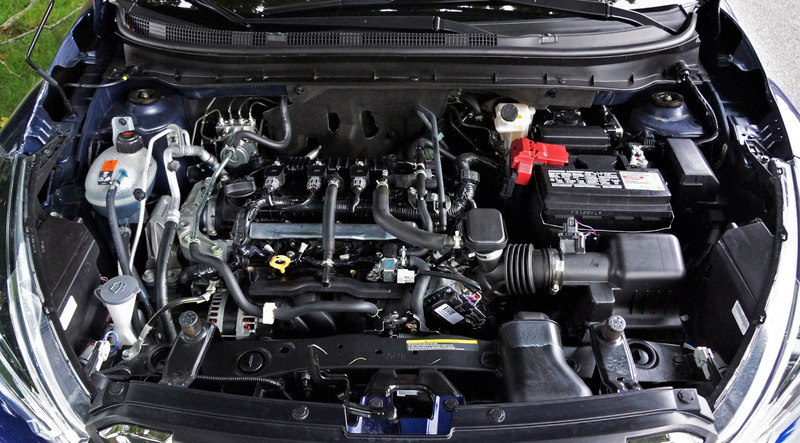 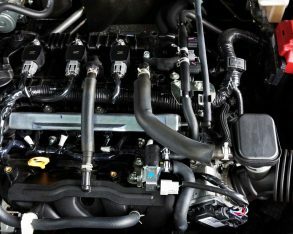 Its sole 1.6-litre four-cylinder makes a less spirited 125 horsepower and only 115 lb-ft of torque compared to 188 horsepower and 177-lb-ft for the Juke, but let’s not forget the just noted low pricing and the new car’s fuel economy advantage. 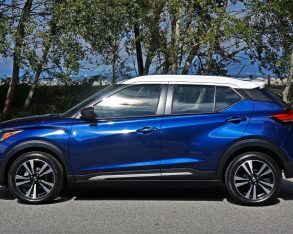 First, the Juke’s available torque-vectoring all-wheel drive system is not on the Kicks menu, nor any AWD option for that matter. 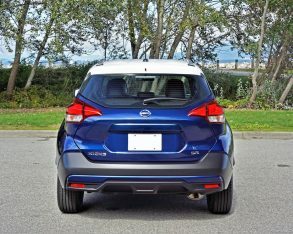 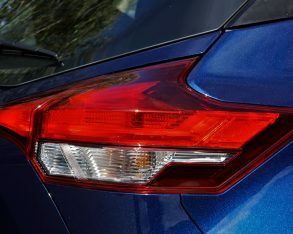 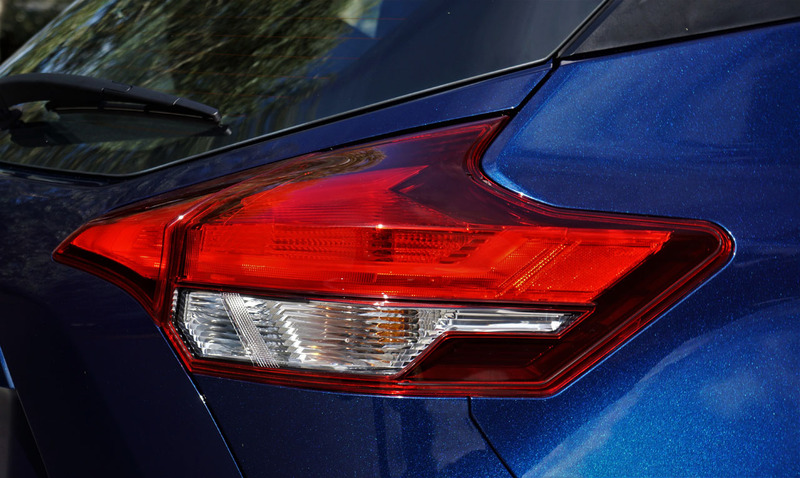 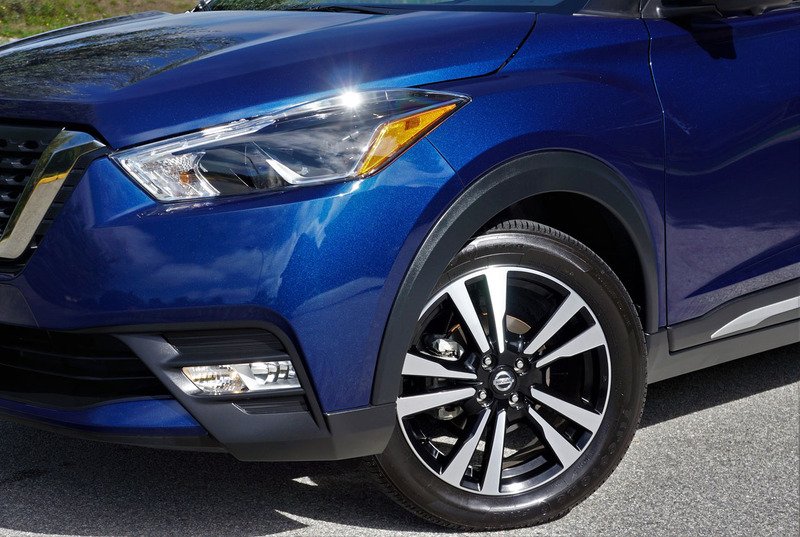 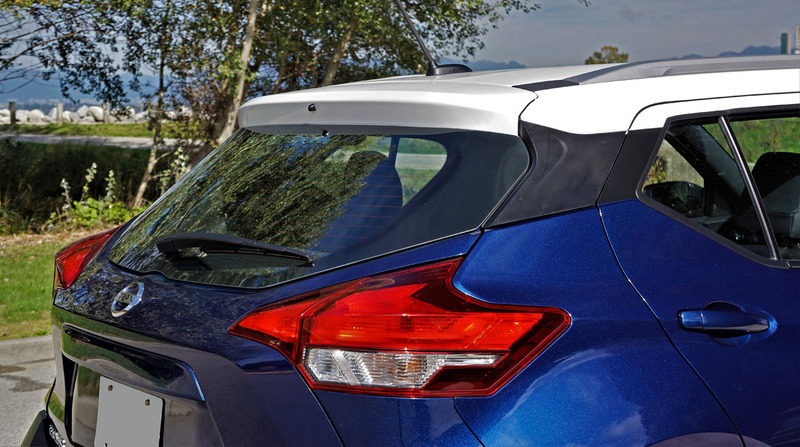 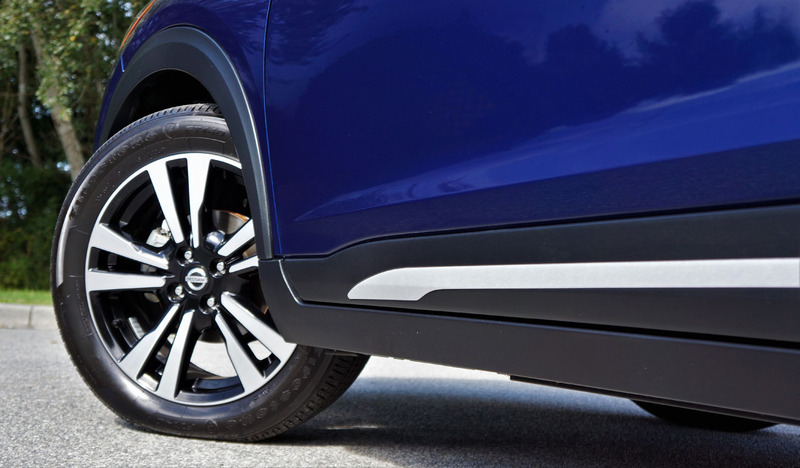 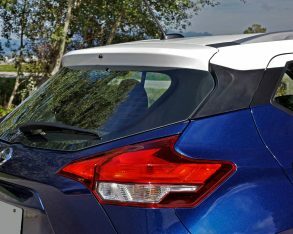 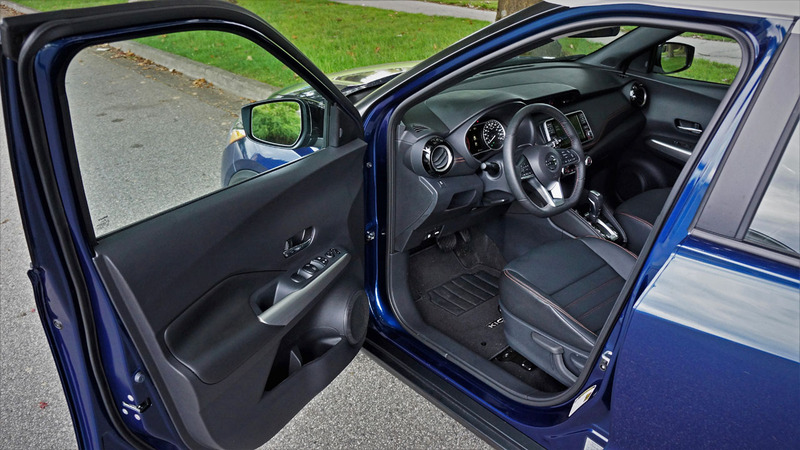 Instead, think of the Kicks as a tall, SUV-style five-door hatchback, which is really what most entries into the subcompact SUV segment are anyway. 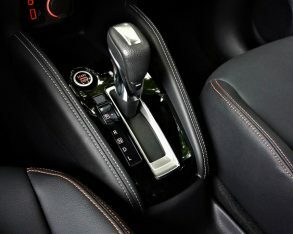 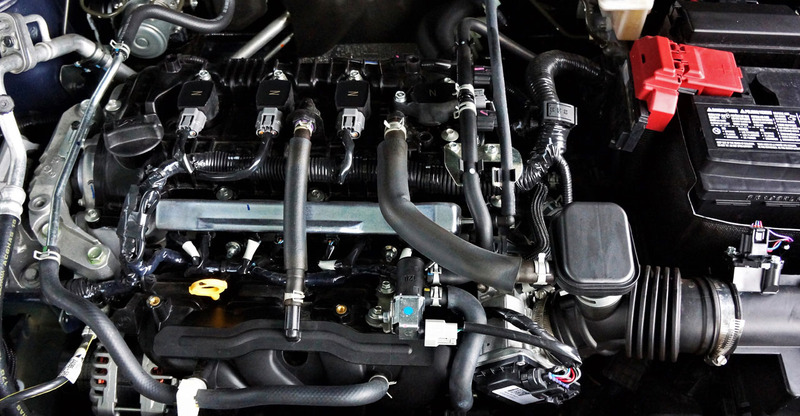 Like with most Nissan models, the transmission is a continuously variable type (CVT) with “shift” points that mimic a conventional automatic. 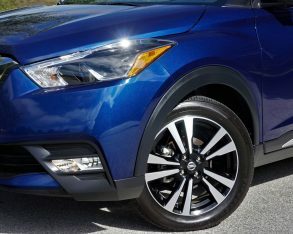 I found the Kicks’ straight-line performance pretty decent too, likely due to its light 1,197-kilo (2,639-lb) curb weight. 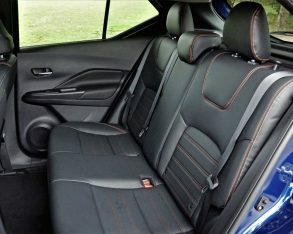 This also boded well for its high-speed handling, which was commendable for this class, while it’s a particularly nice little SUV to drive around the city, providing a good view of the road ahead and around, plus a nice, comfortable ride, aided by those comfy seats noted earlier. 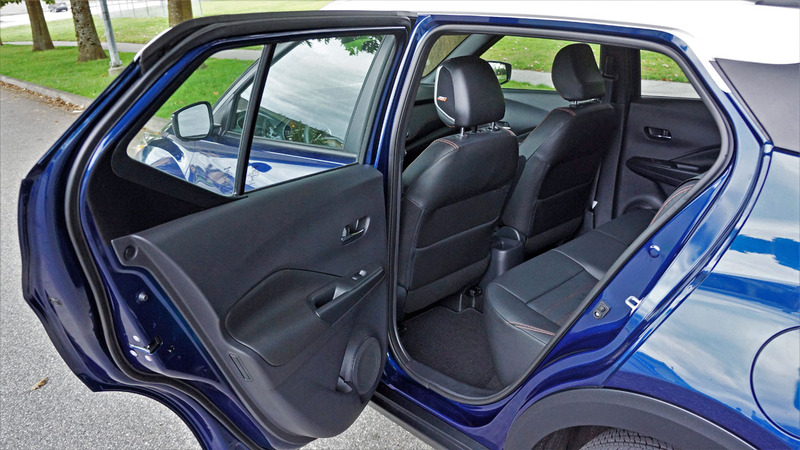 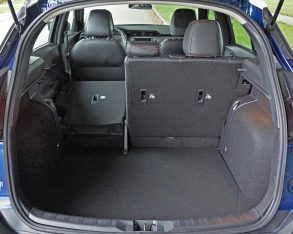 It’s roomier inside than its outward dimensions suggest too, with headroom galore and not shortage of side-to-side space or legroom, whether seated up front or in the back. 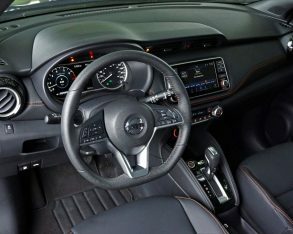 The driver’s seat is supportive in all the right ways, and there’s excellent reach and rake from the tilt and telescopic steering column for finding an optimal driving position. 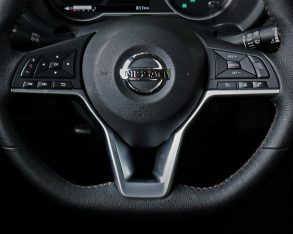 This can be a big problem for my long-legged, shorter torso body type, so the Kicks’ ergonomically designed cockpit was very welcome. 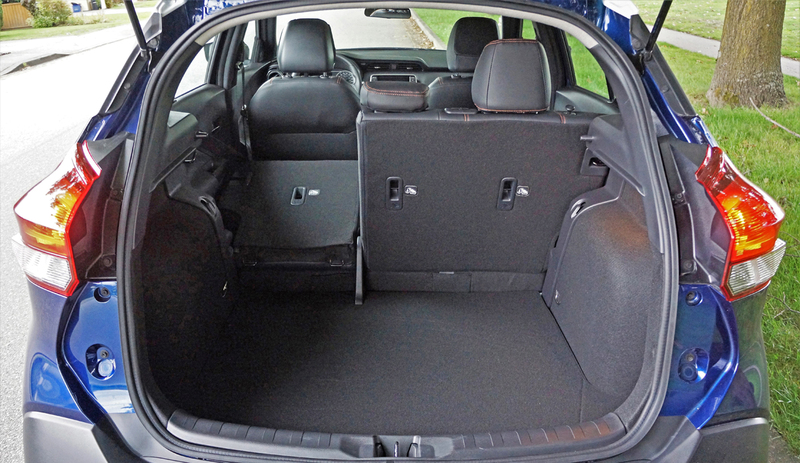 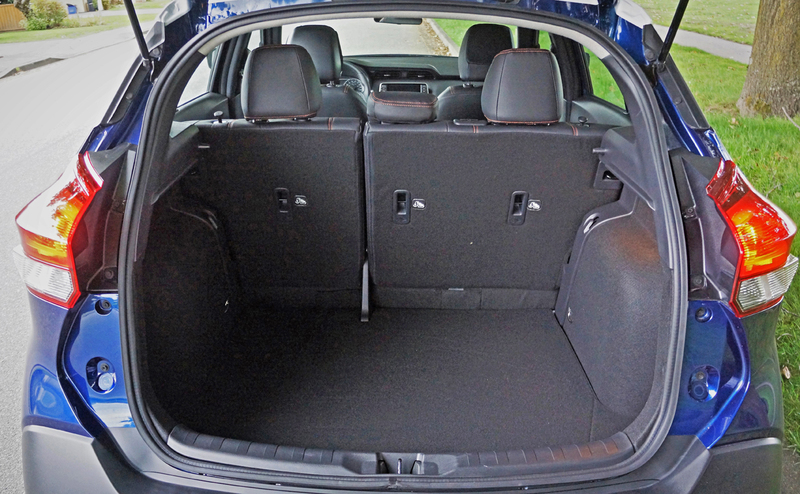 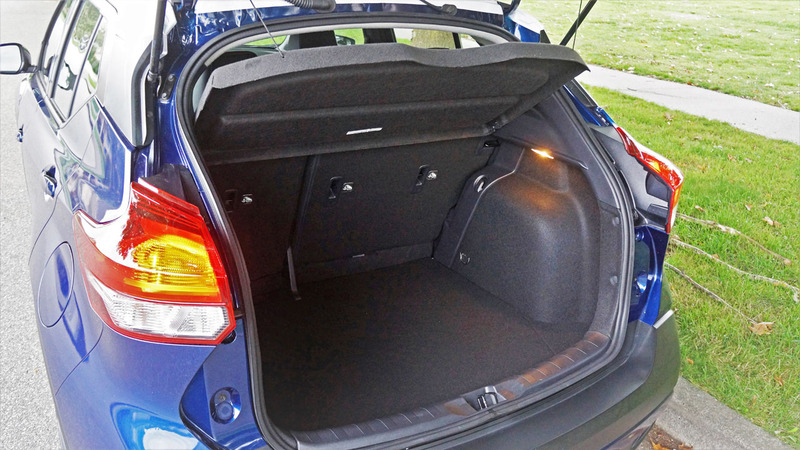 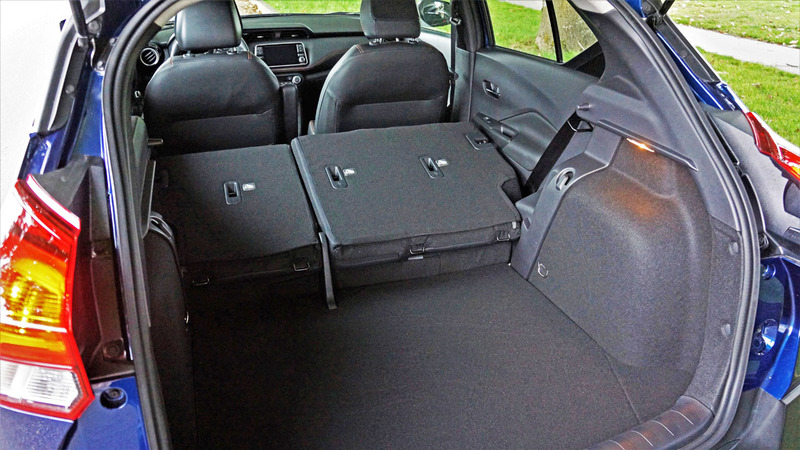 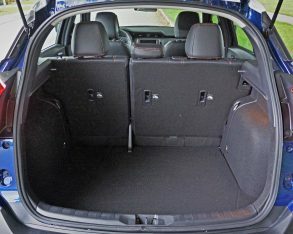 Cargo space is ample at 716 litres (25.3 cubic feet) total, but there’s a pretty big hump where the cargo floor meets up with the back seats, and unlike some other models within Nissan’s SUV range, there’s no multiple-level load shelf to provide a larger flat surface area. 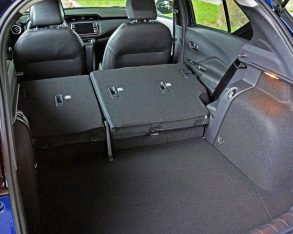 The seats only fold 60/40 with no centre pass-through, and while this is status quo for the class, I’m always happier when I can stow longer items like skis down the middle, leaving both outboard seats for passengers. 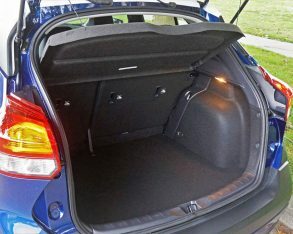 As for fuel-efficiency, only adding an EV plug could make it better. 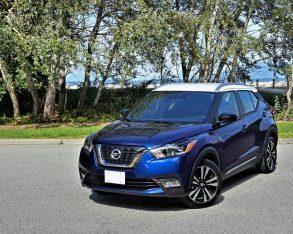 Nissan claims a 7.7 L/100km city and 6.6 highway rating, while I managed a bit over 7.0 L/100km combined city and highway during my weeklong test. 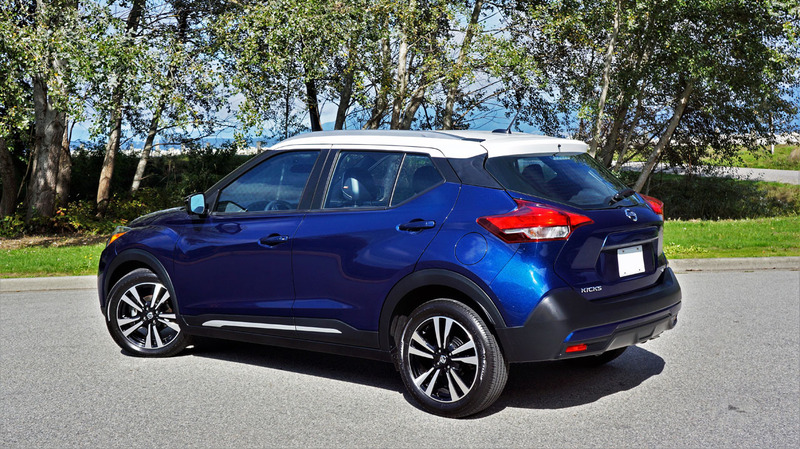 That’s excellent for any non-electrified car, let alone an SUV. 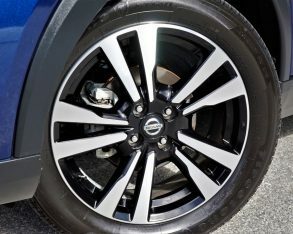 All in all, I’d be very happy to live with the new Kicks as my daily driver. 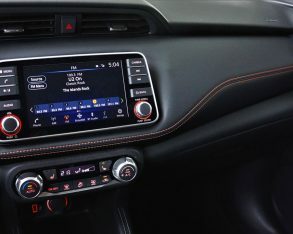 My SR trimmed tester certainly met my needs for comfort, luxury and premium-level features, while its lack of navigation was easily remedied by Android Auto, which allowed me to project GPS mapping and directions info from my phone right onto the infotainment display. 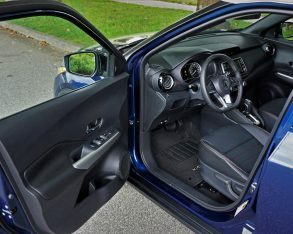 Its balance of performance and fuel economy seemed just right too, while the Kicks’ overall roominess and practicality was more than adequate for my everyday requirements.